Spinal Decompression Therapy is a non-invasive, non-surgical, and drug free treatment for neck and back pain. It is commonly used to treat conditions such as: sciatica, herniated or bulging discs, facet syndrome, pinched nerves, and other spinal afflictions. Even people with chronic long term pain have had success, also people with less severe conditions like mild back and neck pain can benefit from this treatment. The vertebrae and spinal discs are two of the major structural components of the spine. The vertebrae are the bones that make up the spinal column. Spinal discs are located between each vertebra; they consist of spongy material that allows for movement in the spine and act partially as a shock absorber. Spinal discs can get compressed and damaged due to injury, age, bad posture, and living a sedentary lifestyle. When the spinal discs are compressed and/or damaged pressure can be exerted on the spinal cord and/or the nerves, causing pain and/or loss of function. Unlike most structures of the body which receive a more direct delivery of oxygen, fluid, and blood, spinal discs are only able to slowly absorb these important supplies as they undergo normal motion; A process called imbibition. Spinal Decompression Therapy's pulling action allows the disc space to expand. This action allows the needed oxygen, fluid, and blood rich nutrients to flood the discs. This motion keeps the disc healthy. Also taking pressure off of compressed discs can relieve pressure on spinal nerves, reducing pain and inflammation. Our Spinal Decompression Table is a vibration-angulations table. The table vibrations reduce friction between the body and the contact points with the table during treatment. Vibration also helps to relax postural muscles: This helps to reduce muscle spasms and it fatigues muscles faster which allows for better results and shorter lengths of treatment times. The amount of treatments necessary will depend on your condition, the severity of the condition, and the region being treated. Patient compliance is a major determinant in treatment length (the more faithful you are in performing prescribed at home exercises, keeping appointments, and following imposed restrictions on working or lifting, the sooner you will be able to complete the treatments and feel better! Do I need a medical referral to receive this treatment? While we do receive many referrals from medical doctors, a referral is not prerequisite for receiving Spinal Decompression Therapy. At the start of each treatment an assistant will fit you with the proper harness (either for lumbar or cervical decompression) and have you lie on the table. When you are properly positioned and comfortable the treatment will begin. 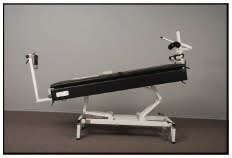 The table will slowly move to provide the prescribed positioning, tension, and the vibration Hz; all this is done to the patient's tolerance and comfort. A treatment will typically last between 8-15 minutes. Treatments are monitored and adjusted to patient's comfort. How are results from treatment monitored? Prior to treatment, patients complete a form called a Functional Rating Index (FRI). The FRI measures patient functionality while participating in normal activities as well as their pain levels during these activities. Based on the patient's functionality and pain levels a FRI score is figured. An FRI is completed halfway through treatment to evaluate patient progress as well as at the conclusion of the initially prescribed treatment. Why should I consider Spinal Decompression Therapy before surgery or medication? While medication may provide relief of your symptoms, ignoring or covering-up your body's signals can do more harm than good. They can provide you with a false sense of security regarding the amount and types of physical activity that you should be doing; this can lead to further damage and injury. Prolonged use of pain medication can lead to building tolerances which make higher dosing necessary to receive relief from pain. Side effects of prolonged use can include liver, kidney, and gastrointestinal damage. Surgery comes with inherent risks in addition to lengthy recovery times. While surgery may be the only viable option for some cases, some studies have shown failure rates for back surgeries to be as high as 50%. Surgeries that initially bring relief often require additional surgeries due to added stress put on areas adjacent to the original operation site. Will my insurance company be billed directly for treatment? Insurance companies are not billed directly. We are happy to provide patients with a detailed receipt that can be submitted for reimbursement. These statements can be picked up at our office or emailed to you for your convenience.